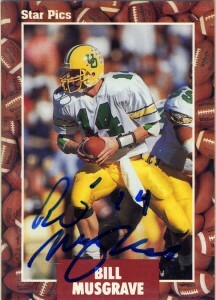 The heir to Chris Miller for the Oregon Ducks, Bill Musgrave enjoyed an excellent college playing career. With a logger jam at quarterback for the Dallas Cowboys, Musgrave would not make the team roster after being drafted by them in 4th round of the 1991 draft. He’d sign with the San Fransisco 49ers and he’d post a 71 quarterback rating throwing 1 touchdown and 2 interceptions. He’d stay with the 49ers through 1994 and then sign with the Denver Broncos staying there through the 1996 season. Bill jumped almost immediately into coaching where he has remained since, working a season a piece for the Raiders and Eagles, and two for the Panthers. Musgrave returned back to the college ranks in 2001 tutoring future Houston Texans quarterback Matt Schaub at UVA. Again he’d surface in the pros with the Jaguars for the next two seasons through 2004 and the Redskins for 2005. Musgrave later spent the most time with the Atlanta Falcons from 2006 – 2010, -later signed with the Minnesota Vikings in 2011 to be offensive coordinator. Musgrave experienced his first offensive play calling with the Eagles and Ray Rhodes, so he probably is a member of the Rhodes’ coaching tree.